On 29 September 1936, David Glasser was born in Alexandria in the Eastern Cape. A strong scholar, he was placed in St Andrews School in Bloemfontein for his primary education, going on to complete his secondary schooling at Grey High School in Port Elizabeth. Matriculating first class in 1954, Glasser was placed fifth in the overall aggregates in the province. Always possessed of a keen curiosity about how things work, science seemed to be the logical career choice. Glasser elected to follow his brother into the field of chemical engineering, obtaining his BSc in chemical engineering with second class honours from the University of Cape Town (UCT) in 1958. Discussing his career choice, Glasser maintains that there is a genetic component, joking that his family, on his own side as well as by marriage, is overrun with chemical engineers. Glasser then moved to the United Kingdom, where he attended the Imperial College of Science, Technology and Medicine in London. He was awarded the PhD DIC in 1964, with his thesis titled Some Kinetic Problems in Oxidation Chain Reactions. Upon his return to South Africa, Glasser was appointed lecturer by the University of the Witwatersrand’s (Wits) Department of Chemical Engineering. In this department, he played an important role in modernising the chemical engineering programme, introducing optimisation and mathematical modelling into the course as well as through his innovative teaching of thermodynamics. He was a key player in the amalgamation of the respective departments of Chemical Engineering and Metallurgy, which joined to become the School of Chemical and Metallurgical Engineering. In addition to his work as a lecturer, he also was responsible for the development and presentation of diverse accredited industry-based short courses. In 1971, Glasser attained the rank of Professor, serving as Head of Department of Chemical Engineering from 1979 until 1983, and again in 1991 until 1993. He was Dean of the Faculty of Engineering from 1986 to 1989 as well as being elected a Senate Member on Council in 1987. His period as Dean coincided with a period of political transition in South Africa, and Glasser was pivotal in developing promising young students from previously disadvantaged backgrounds, aiming to increase numbers and success rates. An important element of his developmental initiatives was taking over the Anglo-American cadet scheme, comprising a year-long programme for young black engineering students before university which prepared them to excel in their studies. He has been a prolific mentor of postgraduate students, and to date, has supervised or co-supervised over 58 MSc students to completion, as well as 52 PhD students. Many of these students have gone on to become highly successful academics placed in internationally renowned tertiary institutions. Glasser’s research has covered a range of topics, including kinetics, thermodynamics, modelling and optimisation, focusing on aspects such as the use of temperature to measure chemical kinetics, the development of homotopy, variational and optimisation issues, and spontaneous combustion modelling in coal mines. In his early work as a researcher, Glasser worked as a consultant on a number of coal mines, investigating the issue of spontaneous combustion of coal and coal wastes in mines. This spontaneous combustion of coal has numerous negative effects, not only because it represents profits lost by the mines, but also because of the ensuing air and water pollution. Glasser’s studies in this area included the development of simple tests to assess materials for their potential combustion, as well as large-scale studies that were used to inform the design and management of full-scale coal dumps. As a consultant to the Grootgeluk Coal Mine in Limpopo and the Leigh Creek Mine in South Australia, he worked to improve the functioning of these mines, suggesting procedural improvements that could reduce the risks of spontaneous combustion taking place, as well as setting measures in place to manage such hazards should they occur. The processes utilised by many coal mines today, in South Africa as well as internationally, are based on Glasser’s work. In addition to this, he also worked on the modelling of fires in tunnels, another potential hazard in the mining industry. This work aimed at clarifying the processes occurring during fires in ventilated ducts, to understanding the interaction between the flow, reaction and transport processes, thereby contributing to improved safety conditions in underground mines. Together with Diane Hildebrandt, one of his former PhD students, Glasser has been involved in numerous high-profile research projects, initially under the auspices of the Centre of Materials and Process Synthesis (COMPS) at Wits, now based at the University of South Africa and renamed the Material and Process Synthesis Research Unit (MaPS). This initiative combines cutting-edge research with industry needs, with a number of patents being registered as a result of activities undertaken in this regard and also supplying technology to commercial plants. The development of the Attainable Region (AR) method is one of these achievements. This groundbreaking method was developed with a view to optimising chemical reactors. It has been successfully applied in bio- medical research such as interpreting imaging experiments, heparin removal in blood and in the development of an artificial liver. The research has since been extended to include other processes, namely mass and heat transfer and separation. In so doing, this research has formed the groundwork of new, optimised methods of process synthesis, eliminating much of the guesswork that was previously involved. The work they have produced in this regard is now internationally recognised and is included in numerous textbooks and syllabi (both at undergraduate and postgraduate level) relating to the design of chemical reactors. A textbook on the topic published by Wiley USA is due to appear in 2016. The development of the Column Profile Map (CPM) method for distillation design is another piece of influential research that Glasser’s team has undertaken. This finding has been described as “one of the three most important developments in distillation over the last decade”, as it enables the synthesis of intricate distillation columns and systems in order to accomplish defined separations. This has also allowed for an enhanced understanding of reactor engineering and separation in a unified theory, rather than being seen as two disparate fields as has been the case. This shift in perspective can allow researchers to further synthesise and optimise a wide range of operations in chemical engineering, applying these techniques in order to better predict the optimal conditions for complex multifunctional pro- cesses, such as reactive distillation. Process synthesis forms another important aspect of the research which the team has engaged in. “We have shown that chemical plants can be viewed as heat engines in which the heat can be used to put in the work that is needed to make the plant feasible,” explains Glasser. This process uses fundamental thermodynamics and allows researchers to set a number of targets for plants functioning at their optimal state, using raw materials efficiently and with minimal carbon dioxide emissions. Then, using a flow-sheet system, researchers are able to evaluate actual performance against these initial targets. One related aspect which has formed a branch of concurrent research, is the kinetics of the Fischer-Tropsch reaction used in the oil-from-coal process. The contributions which have been made by Glasser and his associates have been significant to the field of chemical engineering, with potential applications in a variety of areas touched by the chemical industry, which is responsible for the manufacturing of essential products such as plastics, petrol, paper, paints, synthetic fibres, and fertilisers. The impact of this work could be viewed as an economic benefit for the manufacturers themselves, allowing savings on cost. Moreover, their findings could be applied in order to use natural resources more efficiently, resulting in less waste, and generating less pollution – making the industry significantly more environmentally-friendly. Current plants may be able to decrease carbon dioxide emissions, while the employment of these ideas in the design of new plants can assist in minimising emissions in future. An acknowledged world leader in his chosen field, Glasser has published more than 170 articles in peer-reviewed journals, as well as having co-authored numerous books and book chapters. He has frequently been invited to present at international conferences, including the Dutch Chemical Engineering Congress, World Coal-To-Oil Conference, the Foundations of Computer-Aided Process Design (FOCAPD) and the Process Development Symposium. In addition to this, he has served as Associate Editor of the Chemical Engineering Journal, as Editor of the Kluwer international book series on chemical engineering and as a reviewer for a number of international publications. Glasser has been involved in the South African Institute of Chemical Engineering in a variety of roles, serving on the council, as well as in the capacity of president. He has also served on the Professional Advisory Committee of the Engineering Council of South Africa. He is a Fellow of both the South African Institute of Chemical Engineering and the Royal Society of South Africa and is an elected member of the South African Academy of Engineering, the American Institution of Chemical Engineering and the Academy of Science of South Africa (ASSAf). He has had the highest rating possible, the A1-rating, conferred upon him by the National Research Foundation. He first received this rating in 1998, subsequently renewed in 2005 and 2011. Over the span of his career, he has acted as Visiting Professor at a number of esteemed institutions, including City College in New York, the University of Houston in Texas, Tel Aviv University in Israel, McMaster University in Canada, the Australian-based Universities of Sydney and New South Wales, as well as Princeton University, USA, where he was a Fulbright Scholar. 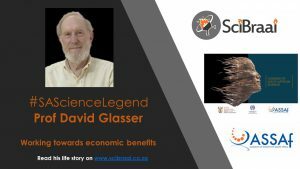 The recipient of plentiful awards, both in his personal capacity as well as in his role as a member of his research team, it is clear that Glasser is an outstanding researcher who has earned the respect of his peers. His family is an essential part of his life, and he relishes time spent with his children, Nadine (senior lecturer in computer science University of New South Wales) and Benjamin John (professor of chemical engineering at Rutgers University in the USA), as well as with his grandchildren. He has been married to his wife, Sylvia, for over 50 years. Sylvia ‘Magogo’ Glasser is a legend in her own right in the field of dance. She made a name for herself as an innovative choreographer, blending a number of eclectic styles and integrating elements of her training as a social anthropologist. She established her own multiracial dance company in 1978 at the height of apartheid. Actively training young dancers from all backgrounds, the rehearsals of Moving into Dance Mophatong were originally held in the Glassers’ garage at their home in Victory Park. She has been made a Knight of the Order of Orange-Nassau by the Netherlands and given the Order of Ikhamanga (Silver) for her forward-thinking work in this capacity. The company maintains its reputation as an inventive contributor to the South African arts, and until recently both Sylvia and David Glasser remained active in the management of this organisation. He is a keen sportsman, enjoying swimming in the sea as well as bodysurfing, and notes that he has played squash (half Blue Imperial College) and tennis (Blue Imperial College) fairly competitively in the past. He also was fond of playing bridge, but gave it up as it became too time-consuming. In addition to these activities, he enjoys reading. Although he officially retired in 2004, he has been rehired on contracts and continues to be an active researcher and supervisor. While the awards are evidence of his contributions, Glasser says that his deepest satisfaction in his career has come from his collaboration with colleagues, suddenly realising that they’ve solved a problem that they’ve been working on for some time. Working in teams is a fulfilling aspect of his work as a researcher, and he continues to be motivated by the development of young and enthusiastic students and colleagues.